With a colorful array of seaweed dressed in a savory sweet dressing that's redolent of toasted sesame, the type of seaweed salad you get at sushi restaurants is easy to make at home. 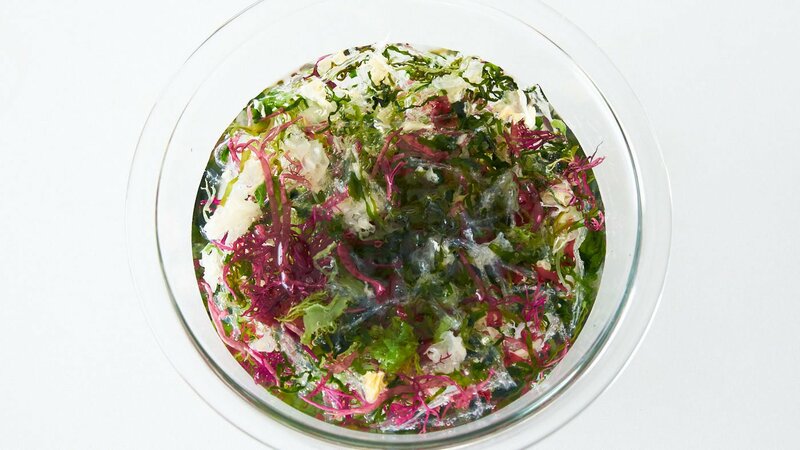 If you’ve ever gone to Japan and asked for a seaweed salad only to get a strange look, followed by a dish that’s not quite what you expected, you might have questioned whether seaweed salad is even Japanese. When translated literally, seaweed salad is Kaisou Sarada (海藻サラダ) in Japanese; however, this refers to any salad with seaweed on top, not the bright green sesame oil seasoned salad we’re used to getting in the States. While there is a similar salad in Japan with a variety of seaweed on top, it’s part of the home cooking repertoire and not something most restaurants would serve (especially a proper sushi restaurant). 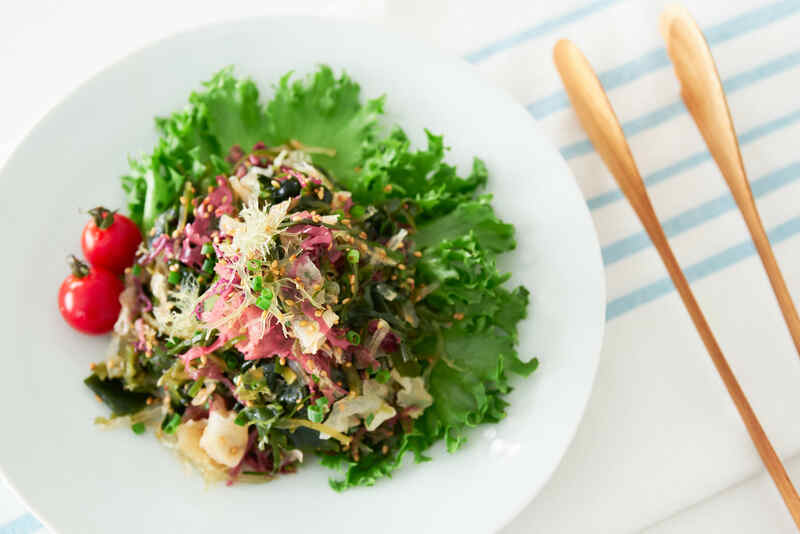 The home-style seaweed salad of Japan usually involves a mix of seaweed on a bed of vegetables such as lettuce, corn, cucumbers, and tomatoes. This is then dressed with whatever dressing you have on hand. Sorry to break it to you guys, but if you’ve been eating seaweed salad because you thought it was healthy, I have news for you. That neon green color that many seaweed salads have is not the natural color of seaweed; it’s food coloring. Places that serve this kind of salad also usually buy it in tubs pre-seasoned, which also means it’s probably loaded with corn syrup and MSG. 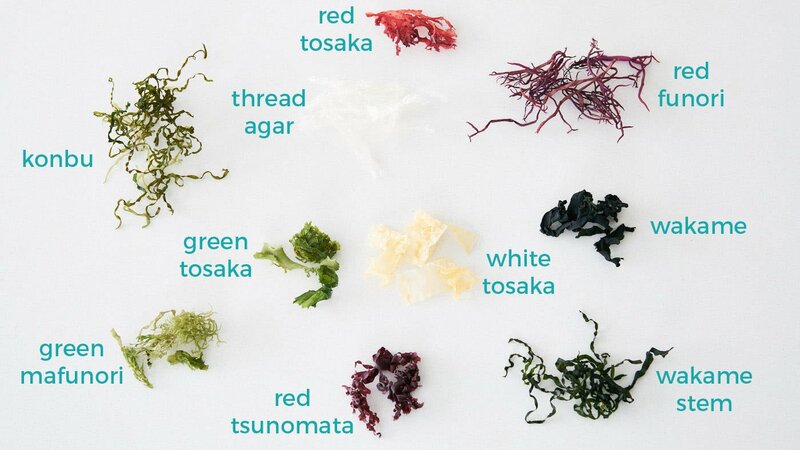 The thing is, seaweed is full of minerals and vitamins, which is why I want to show you guys how to make it at home. It won’t have quite the same color, but I guarantee it will taste just as good, if not better! There are hundreds, if not thousands, of different seaweed in the oceans of the world. They’re not all edible, but many of them are, and they each have a unique color and texture. That’s why I usually prefer calling these sea veggies rather than seaweed. Most seaweed salads include more than one kind of seaweed and here’s the mix I used. Don’t feel like you need to find one with all of these, but the more variety your mix has, the more colors and textures your salad will have. Where do I get Seaweed? Japanese grocery stores should carry bags of assorted dried seaweed, specifically for making a salad. If you don’t have a Japanese grocery store nearby, try searching the web or online retailers such as Amazon. Although most seaweed will rehydrate in about 6-7 minutes, it takes much longer than that for the moisture content to reach equilibrium. The problem is, if you soak the seaweed for too long, it will get soggy and water down the dressing. That’s why I like draining it at around the 6-7 minute mark and then let it rehydrate the rest of the way in the dressing. Once you’ve tossed the seaweed salad with the dressing, I’d recommend letting it sit for at least an hour before eating, but it tastes best when left in the fridge overnight. 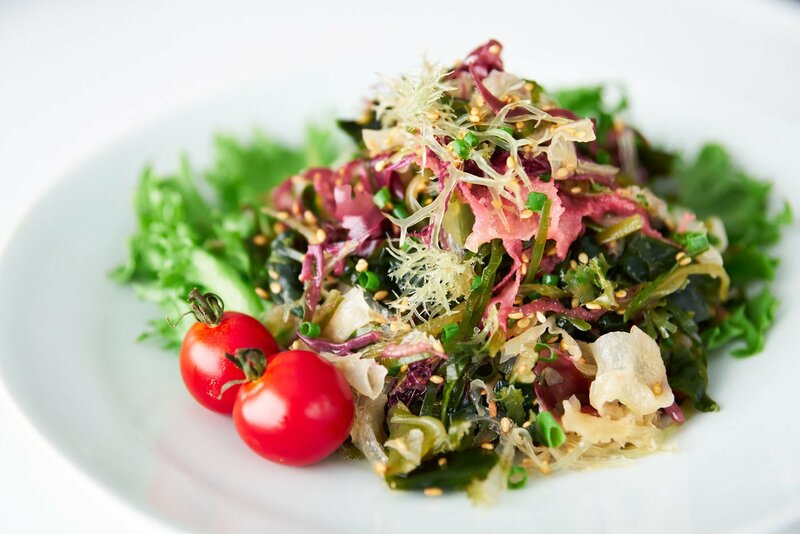 Japanese-American style seaweed salad gets its trademark flavor from toasted sesame oil, which is combined with soy sauce, sugar, vinegar, and salt. This creates a sweet, savory and tangy dressing brimming with the nutty flavor of toasted sesame. I like the warm spicy kick that ginger adds, so I’ve also added some ginger juice to the sauce; this imparts a ginger flavor without the tough fibrous bits of ginger getting in the way. To make ginger juice, grate some ginger and then pass it through a strainer, pressing on the solids to get all the juice out. I also wanted my salad to have a milder flavor that won’t have you reaching for a glass of water after every bite, so I haven’t used a ton of salt or sugar in the dressing. If you want to make it more like the store bought kind, increase the amount of sugar and salt. I know some seaweed salads are a bit spicy, so you want more heat, try adding some chili flakes, or a chili paste like sambal oelek to the dressing. 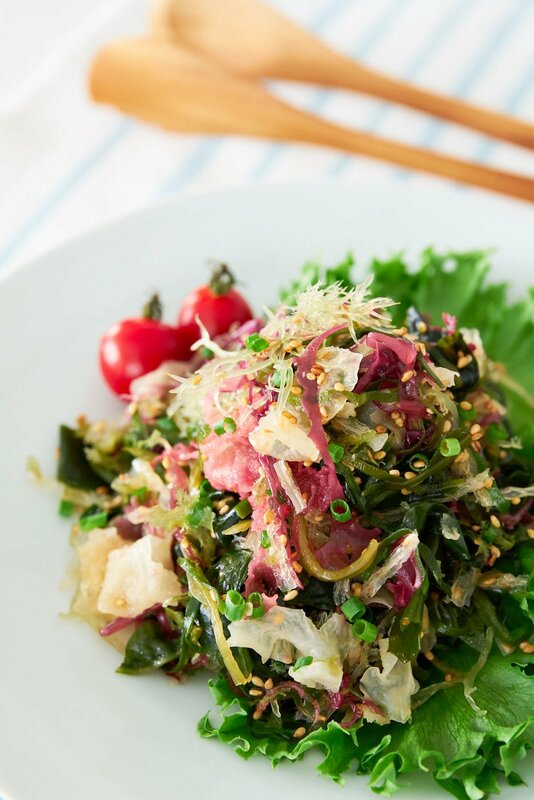 In Japan, seaweed salad is often dressed with Ponzu, which is a citrus sauce made with yuzu juice, soy sauce, and a bit of sugar. It’s light, refreshing, and perhaps my favorite way of dressing this nutrient-dense salad. Put the seaweed in a bowl and cover with cold water. Let this rehydrate for 7 minutes. 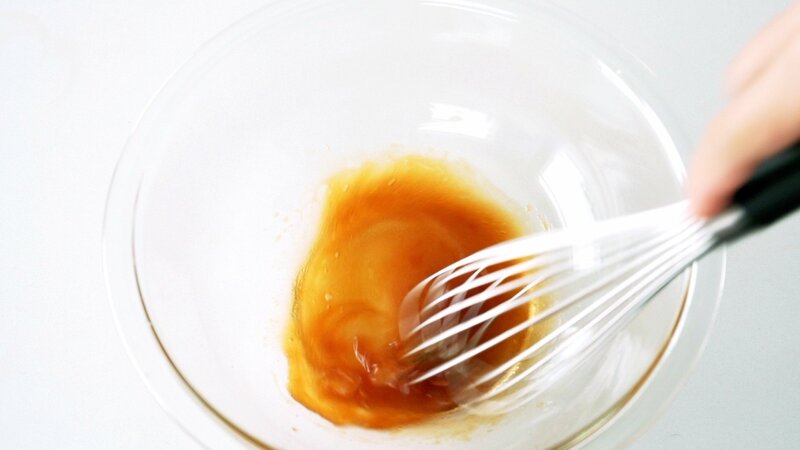 In a medium bowl, whisk the dressing ingredients together until the sugar and salt are completely dissolved. 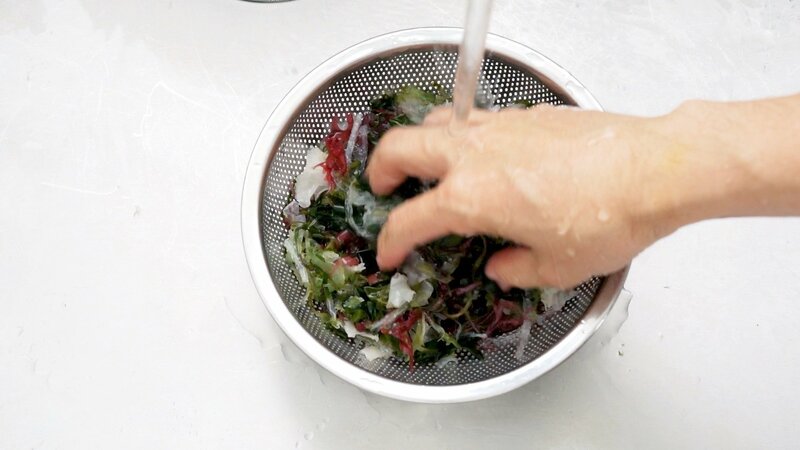 When the seaweed has rehydrated, pour the seaweed into a colander and then rinse it thoroughly. Use your hands to gather up the seaweed and then squeeze as much water out of it as you can. 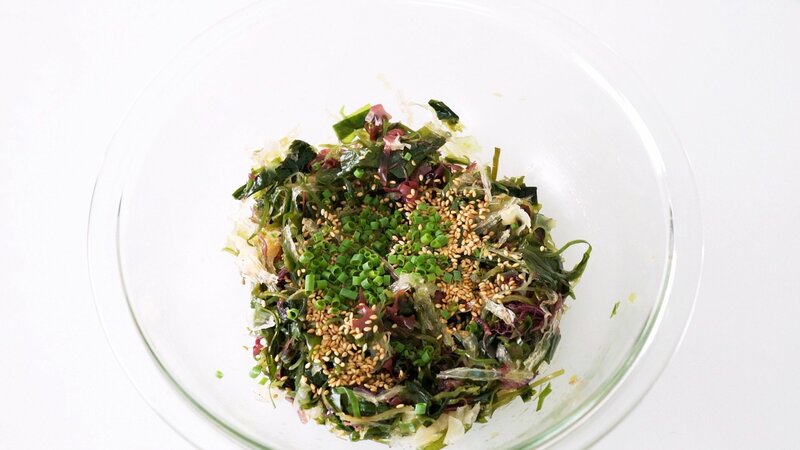 Add the rehydrated seaweed to the bowl with the dressing and then add the sesame seeds and scallions. Toss to coat evenly and adjust the seasonings to taste.